Gentleness is an enigma. Taken up in a double movement of welcoming and giving, it appears on the threshold of passages signed off by birth and death. Because it has its degrees of intensity, because it is a symbolic force, and because it has a transformative ability over things and beings, it is a power. The simplicity of gentleness is misleading. It is an active passivity that may become an extraordinary force of symbolic resistance and, as such, become central to both ethics and politics. 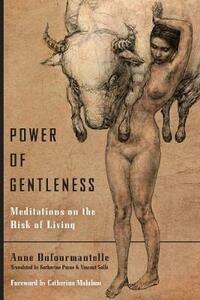 Gentleness is a force of secret life-giving transformation linked to what the ancients called potentiality. In our day, gentleness is sold to us under its related form of diluted mawkishness. By infantilizing it our era denies it. This is how we try to overcome the high demands of its subtlety-no longer by fighting it, but by enfeebling it. Language itself is therefore perverted: what our society intends to give the human beings that it crushes "gently," it does in the name of the highest values: happiness, truth, security. From listening to those who come to me and confide their despair, I have heard it expressed in every lived experience. I have felt its force of resistance and its intangible magic. In mediating its relation to the world, it appears that its intelligence carries life, saves and amplifies it.